Experts agree that kids can take on daily and weekly chores from as young as the age of two or three. Making a chore chart together means kids are clear on the expectations and can see their progress day by day. All you need is a few paint colours, wooden clothespins and a piece of plywood. 1. Sit down together and make a list of age-appropriate tasks for each child. While you’re brainstorming, kids can be painting a set of eight to 10 clothespins with their designated paint colour. 2. Paint a small, square cut of plywood with chalkboard paint. Allow board and clothespins to dry completely. 3. Using a thin-tipped permanent marker, write each child’s chores on their clothespins. 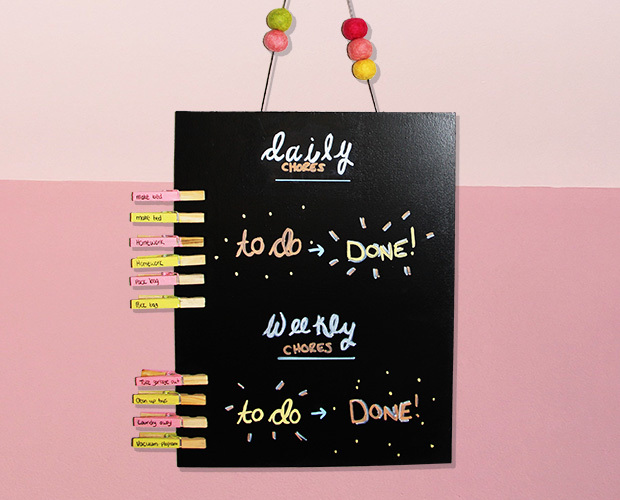 Write ‘Daily’ and ‘Weekly’ as well as ‘To do’ and ‘Done’ on the board in chalk markers. 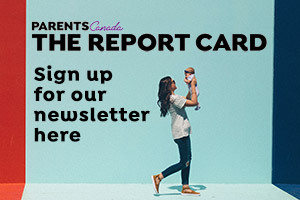 Originally published in the ParentsCanada Fall 2018 issue. Touchy subject: Should you pay your kids for chores?